I have new found respect for the business card. It works. Various forms of new technology with the promise of a better solution have tried many times to kill this old-school piece of paper, but none have really delivered a better solution. The business card wins because it is simple, cheap, and reliable. The one problem with the business card is the subsequent data-entry burden that most of us endure post exchange. There are several solutions. I use a scanning service called CloudContacts. This service scans cards and makes them easy to import into other applications. They also scan and convert hand written notes on the back. I did a longer post on CloudContacts here. The Palm PDA had a good idea to use its IR radio to exchange contacts (and other items). This mostly worked only with other Palms. PDAs gave way to the smartphone – and IR didn’t make the cut. Wi-Fi standards will soon enable simple peer-to-peer and personal area services, but not today. There’s been a few attempts – like bump, but nothing really mainstream yet. About a year ago, I added to the front of my business card a QR code. I recommend this. I’ve had people take my card, scan and hand it back. The QR code eliminates the burden of data entry to any smartphone owner. QR codes can be used for multiple types of data, including contacts. You can generate your own QR code at several sites – here’s one. Not everyone has a smartphone (yet), so a paper card with a QR code offers a passive upgrade option, easy to ignore for those that don’t want to scan. At a recent conference I met Daniel, he was wearing his iPhone as a name badge. 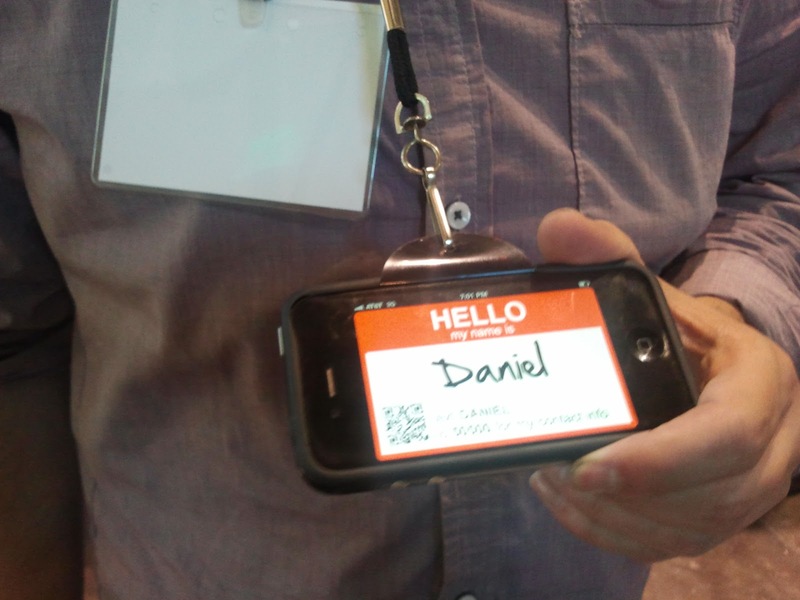 Daniel had developed a clever app that combines SMS and QR codes along with the iPhone iteself as the medium. For him the hard part was creating special plastic holder to make the phone wearable. The name display alternated between the name tag and recent tweets. Brilliant. To get his contact information, I could scan his QR code displayed on the phone, OR SMS his app to automatically receive his details via return SMS. It was a nice way to eliminate the card, but I still have to move the data from SMS to Contacts. I tried the name tag application on my phone, but ran into several issues as it was created for iPhones. However, the concept is gold. It could easily be expanded to a multi-platform service. At another conference, I had the opportunity to try out a Minglestick. Everyone at the conference was provided one – and if you found someone you wanted to exchange contact details with you each go through this mating ritual involving crossing of the sticks until a green light appears. 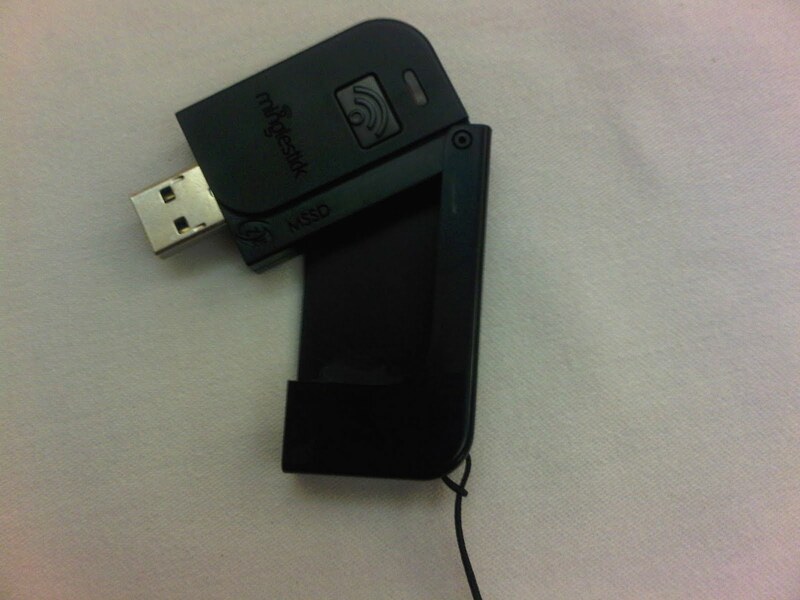 The USB portion of the stick is for the vendor, not the user. The concept itself is fairly simple – no business cards, no paper, no scanning, and at the end of the conference – all the contacts are available for download. Perfect in concept, stupid in practice. The sad irony is the MingleStick was used at a conference for a Japanese company – and the Japanese have ritual and respect around exchanging business cards. Paper business cards work. Update them with a QR code. New technologies are interesting and maybe someday will prove useful. Just not today.